A large US manufacturer produces multi-layer ceramic capacitors for the electronics industry. Ceramic capacitors are used in cellular phones, radios, communications equipment and computers. The multi-layer capacitors are made of ceramic material fired in kilns (like other ceramics). Part of the manufacturing process involves a "dicer" production machine. 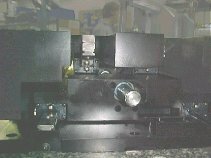 This machine slices and dices a ten inch "green" ceramic capacitor product into pieces that are 0.06 inch X 0.03 inch. There are a large number of blades that cut the ceramic. Precise positioning and controlled motion is required to pass the ceramic material through the saws to slice the material, then rotate it 90 degrees for the dicing. A positioner is needed to precisely position the cutting tool across the ten inch ceramic piece. In addition, a Z-axis positioner is required to provide a stable support platform which can provide vertical translation while maintaining X-Y positional integrity. 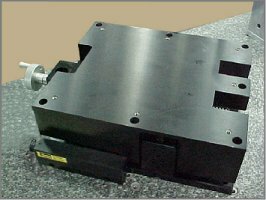 A custom designed Z-axis platfrorm was designed and developed to address the Z-axis requirements. It offered high strength, stiffness, and low height, in combination with controlled motion, and positioning capability. A uniquely designed "wedge" style drive system was employed to permit all of the customers objectives to be met. Thorough testing of the prototype unit verified the computer designed performance parameters, and assured that the required life expectancy would easily be achieved..